Plants need nitrogen for stem and leaf growth and to keep their foliage green. Several materials provide nitrogen to the soil, each containing their own pros and cons. Which nitrogen fertilizer will prove to be the best for your garden depends on your budget, time constraints, the availability of the source, your philosophy on animal products and on organic vs. synthetic fertilizers. Bagged manure from the garden center has been aged and processed to guarantee good texture and the absence of harmful E. coli bacteria associated with fresh animal waste. 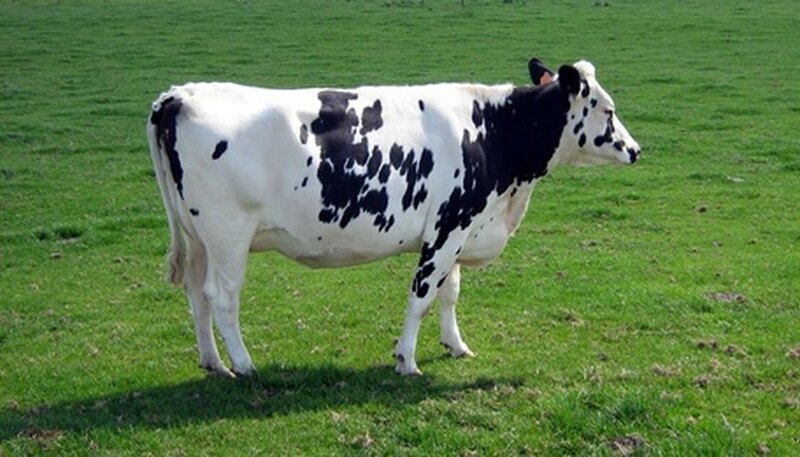 The most common source of commercial manure is cow manure, which contains less per-pound nitrogen than that of smaller farm animals, which is not usually available commercial. Bagged cow manure is found at most nurseries and costs much less than more difficult-to-obtain nitrogen fertilizers, such as bat guano. Because it is processed to a soil-like consistency, it also helps loosen up hard-packed soils. Bagged bat guano, though more expensive, contains up to 12 times the nitrogen of cow manure and is increasingly available from organic nurseries and mail order sources. Using manure from your own or a neighbor’s barn animal waste provides a free, steadily available source of nitrogen. In addition, you can often add the used bedding, which not only adds bulk to the soil or compost pile through the hay or sawdust, but provides nitrogen-rich urine as well as solid waste. Keep in mind, however, that manure needs to be aged at least three months before it is added to the garden. By layering such nitrogen-rich elements as vegetable scraps, coffee grounds and grass clippings with carbon-rich hay or leaves in the compost pile, you can build a rich, organic fertilizer high not only in nitrogen, but in other elements as well. The disadvantage, of course, is that it takes weeks or months to turn compost into “black gold,” depending on the size of the pile and how frequently it is turned. Liquid fish emulsion is usually sold in lightweight bottles containing directions on the amounts of the product to use per quart or gallon of water. Use it to bolster the growth of plants rather than to enrich the soil; fish emulsion is one of the fastest-acting nitrogen sources but its effectiveness lasts only two or three weeks. Think of it as a vitamin shot for your plants, rather than the steady diet of nitrogen which sources like manure and blood meal provide. For a free liquid fertilizer, place compost or manure in a burlap bag, add the bag to a clean trash can filled with water, and let it soak for several weeks. This "tea" provides the same quick boost to plants that liquid fish emulsion does. Liquid fertilizers work best if they are watered directly onto the plant foliage rather than the soil around the plants. Reapply every two to three weeks. The “meals”--cottonseed meal, crab meal, blood meal, soybean meal, feather meal and others—are ground, processed materials which provide organic sources of nitrogen. Cost and availability may vary by region; gardeners close to a crab or chicken processing plant, for example, may find the corresponding meal products are much cheaper than those far away. All are either medium to slow release sources of nitrogen, with effectiveness ranging from six weeks to six months. Sow your gardens or fields with the “green manures” such as alfalfa, clover or annual rye nine months to a year in advance of planting. Till the crops into the soil in early spring, and plant after two to three months. Cover crops not only add nitrogen to the soil, but mine valuable nutrients from the subsoil. They also hold down weeds, loosen soil and prevent erosion. Perhaps the simplest forms of chemical fertilizers are those commonly sold as 10-10-10, 5-10-5, and so forth. The three numbers refer to the percentage of nitrogen, phosphorous and potassium, respectively, in each bag (i.e. ; the first number represents the nitrogen content); the rest is simply filler material. These packages will tell you how much to use per square foot, depending on use—rose bushes as opposed to vegetable gardens, for example. Opinions differ on the safety of these fertilizers. Some people use them for all of their gardening needs, some just for ornamentals but not for edibles, while other fear their effects on the environment and avoid them altogether. As you might expect, not only do opinions differ wildly, but scientific opinions conflict as well.